That explains what happened to me last night while bored and waiting for hubby to get home from a long drive from Cleveland. I had two tabs open on Foxfire and was cruising Facebook and Google at the same time. See, I multi task... Anyways, I was looking for mixed media artwork, which I often do when I need inspiration or just get my juices flowing creatively, AND people that I went to school with. I found 3 people that I have lost touch with and can't believe I found... Steve, whom I worked with on Fredonia's radio station and had a little thing with but were much better friends than the other; Greg, who I had a crush on in high school and he left to go to Cali and join the air force. He had made me a mixed tape that I practically wore out; and Brandin, who I was friend's with from nursery school until middle school and then we found seperate groups to hang with but she was always a sweetheart and stayed nice to everyone. There are many coincidences here... Greg is back in Syracuse and is married. I have chatted a bit with him online and he can't believe that I still have that mixed tape... it was darn good! He had good taste in music and humor. Brandin co-owns Webster's Pages! I was floored when I found this out! She is in the scrap industry AND the art world. She was always artistic and classy. We had alot in common, just not our circle of friends. I am so happy for her success and she has gorgeous kids besides. She looks like I remember her and is a classic beauty. I'm not surprised that she has done so well! Joe's work is breathtaking! 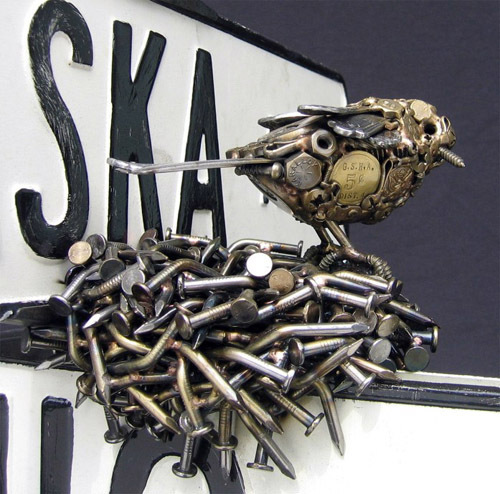 I am in awe of his sculptures made of found metal objects that take the form of birds and nature. It is a delicate and sweaty process of piecing, welding, and collecting. I love that! I am in love with this piece. I can't even imagine how long it took to make and if I could afford it, I would buy it and lovingly look at it everyday. I think I may just visit his site daily so I can sigh and oooohhh over it all. I think I may have to save up to get one eventually! It makes me so happy! This is another example of gorgeous artwork that just makes me swoon. 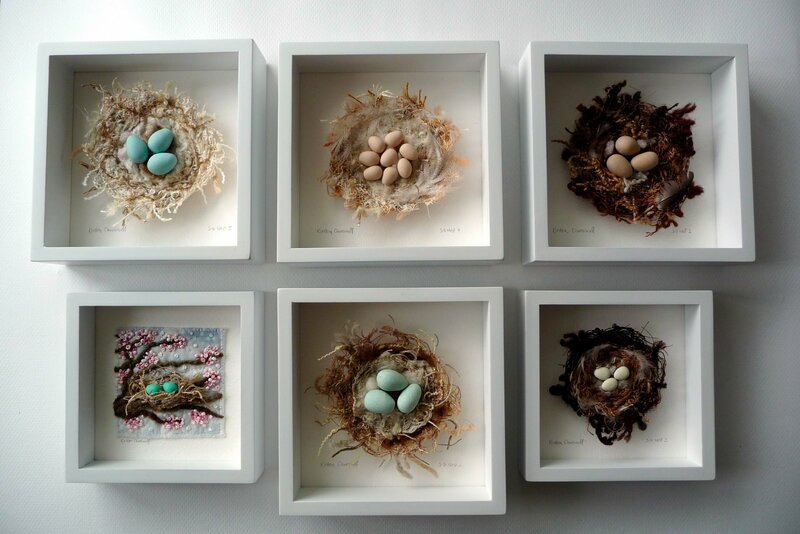 Her use of fibers and fabrics to make the nests makes me want to touch them. They just beckon to be adored. I have such an obsession for nests and birds and when I find one that makes my heart soar, well, it's just something I can't put into words. These do... they are beautiful and precious. Lee Gainer 's artwork , "Popsicle", is made of papertowel rolls, fabrics, papers, and other found objects with lots of color and energy, I love it! I want to make my own version.. This artist has inspired me! I love the earthiness to this and the clean graphic appeal too. It's just amazing! She has an Etsy shop that has some fabulously "green" works of art. She uses mostly all found objects and fabrics that are rolled and adhered... brilliant!! I hope that I have inspired you to go find your serendipity today... sometimes just browsing, while it seems like a waste of time, is really just opening yourself up to ideas and found inspiration!!! Woah! Amazing art. Love them all - tfs! Wow -- thanks for sharing these! "Popsicle" is my fave...but Pogan's nail nest is brilliant, too.